We all have seen them at least once in our search life time. A "did you mean" in red at the top of the Google will display for a query where you did mean to search for that. A Google Web Search Help thread asks, is there a way to tell Google, "no - I did mean to search for my search query." Wouldn't it be helpful to Google and to the searcher (to feel some satisfaction) to have a link to tell Google, no, I didn't mean that. Clearly, that clutters up the page, but maybe a little X or "No" link. I know Google can use this data on some level. 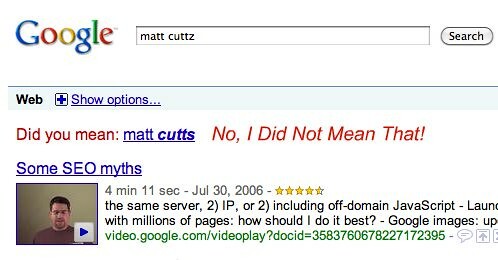 A searcher who goes out of his way to click "no" says a lot more than a searcher who skips past the "Did you mean" link. In any event, Google has been experimenting with how they handle such "Did you mean" results over the years. Maybe we will see this as a test one day?